The complete guide on Retail for emerging retailers, students, and industry observers. Description of "The A to Z of Retail Management"
The A to Z of Retail Management is based on authors experience of working in the retail industry. This is an excellent desk reference for anyone thinking about starting a retail business or simply wants to gain knowledge about retail business. This book covers all the aspect of Retail Management and is a must have for any retailers bookshelf. This book covers major retailing topics, including omni-channel retailing, supply chain management in retailing, information systems, store location, retail institutions, franchising and human resource management. About Swapnil Saurav: Swapnil has more than 9 years of work experience in IT industry with focus on Supply Chain in Retail and Manufacturing industries. His expertise lies in figuring out ways to do what others say can't be done. He holds MBA from S.P. Jain Institute of Management & Research, M.S. (BITS, Pilani) and B.E. (Visvesvaraya Technological University). Management, Indore and B.E from Vasavi College of Engineering, Hyderabad. In his free time he likes to spend time with family and is passionate about cricket. 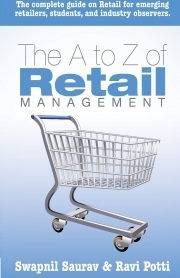 Reviews of "The A to Z of Retail Management"